“Main Street Lake Cruises’ Lake Queen” is the perfect way to enjoy time on the lake in Branson…without getting wet! It offers a great time, which is a really good thing…because it’s the only cruise operation on Lake Taneycomo! What makes it special? It gives you a more relaxing form of lunch-time entertainment; you can enjoy a scenic journey along the lake while you eat. Your well-informed, extensively trained, and certified boat captain guides you safely along the flowing waters of the river-like Taneycomo, while sharing stories about the lake, landmarks you’ll encounter along the way, and the wildlife that make their home on this unique lake. Most people will go their entire lives without seeing where the majestic bald eagle lives; on this cruise, you’ll come upon shoreline areas inhabited by the bald eagle, and visitors frequently get to see these incredible creatures perched in the trees or soaring above the water; these sites alone are worth the trip! The “Lake Queen” isn’t just any boat; it’s an authentic recreation of the paddlewheel boats once abundant on the White River, the body of water dammed to create Lake Taneycomo. 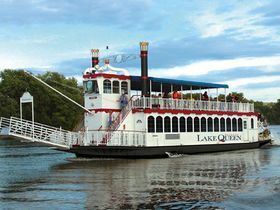 Unlike the boats of yesteryear, the “Lake Queen” offers a climate-controlled lower deck, restrooms, and an open-air upper deck, the best place for viewing both the wildlife and the scenery. Another excellent feature is that Branson Landing is right next door to “Main Street Lake Cruises,” making it convenient to add a little shopping to your day at the lake! Branson offers a wide variety of soft, and more extreme, adventure experiences; there’s simply too many to list! But, there’s only one place that offers a genuinely beautiful, relaxing, and fulfilling way to enjoy Lake Taneycomo, and that’s “Main Street Lake Cruises’!” Make reservations now for a lunch-time cruise about the delightful “Lake Queen,” and discover your new favorite lake experience in Branson!